This is the easiest Educating Peter post I think I’m ever going to write. This week young Michael (Hi, Michael!) 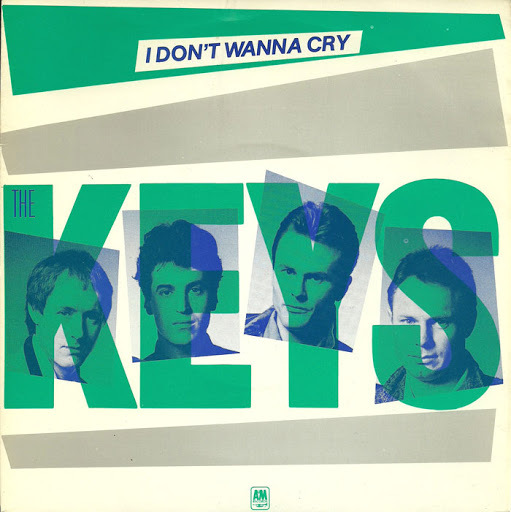 suggested an obscure Power Pop / New Wave song from 1981 called “I Don’t Wanna Cry” by The Keys. Unbeknownst to Michael, “I Don’t Wanna Cry” has already appeared on the blog. Easy. The song made its first appearance in amongst four other songs in an instalment of another, much older series on this blog called Frank’s Faves on Fridays. That series was instigated by my friend Frank (Hi, Frank!) who, every Friday, would send me four or five of his favourite songs. And, like the Educating Peter series, Frank handed the songs over to me, and I would offer my thoughts on them. When I received “I Don’t Wanna Cry” from Michael, the names of both the song and the band didn’t look familiar at all. And when I started listening to the song it didn’t sound familiar. But then the singing started and BAM!, I remembered it. I also remembered that I had put it on the blog at some point in time. So I’m just going to copy and paste what I wrote about back then. 2) One of the song’s recurring riffs has a passing note that made me screw up my face the first couple of times I heard it. (One example is at 1:21.) I’m used to it now, but I thought it just a tad sour in amongst the rest of the song. I’ve just listened to “I Don’t Wanna Cry” again, and I’d say that pretty much everything I said earlier still applies. But I’ll finish this post by swivelling back to talking about The Keys. and I’ll do it effortlessly. Thanks to the PVAc to 44.1 kHz blog’s Blog Kihn for the album. And I dare say Blog Kihn thanks the Power Pop Lovers Blog, which is where it came from originally. A thoroughly enjoyable 50’s song. These are the kind of songs I love grabbing a guitar and playing along to. I laughed out loud when I first heard that guitar chord at 0:05. It sounded more like a child squealing (or a bird squawking) than a guitar. Now that I’m listening to the rest of the song, I’m thinking that this may be a novelty song, considering the fabulously nonsensical background singing (what are they singing?). But besides – or maybe because of – the thoroughly cryptic lyrics (apart from the occasional “baby”, I don’t understand anything they’re singing), the song is a great bit of 50’s fun. And I love that guitar solo (at 1:10) – it sounds like the guitarist is doing his or her best to imitate a train whistle. Great stuff. What an odd song. It starts off as a Motown/Funk hybrid (love the beat and that bass), but then the funky music comes to an abrupt stop to make way for a sort of soul ballad (at 0:29) as the singer pours his heart out. I sort of enjoyed “Expressway To Your Heart” but it sounded ‘bitty’ to me: bits of different songs and styles were grafted on to each other, but the whole thing didn’t sound cohesive. Consequently, I liked some bits of it, but not other bits. Another odd thing for me is that I thought the song was way too short. I was surprised when it faded out. I thought the song was going to keep going, but it faded out at the strangest moment (at what I thought was going to be the middle section, where the singers were expanding on their woes). I wouldn’t have minded it going on for much longer. I’ve heard the song a few times now (three), and each time I’m surprised and mildly disappointed when the song fades out. Ah, well. Now, this must be a novelty song from the 50’s. The words here are even more nonsensical than the ones in The Tonettes’ song. The main lyrics are actually gibberish. This song is silly. And I liked it. I didn’t love it, though, because of the verses staying on the one chord which was way too monotonous for me. And I winced at the bad harmony singing at the end of the song (1:58-2:02). Still, it’s a fun song. Very nice guitar playing. I could go on and on about the various aspects of the guitar work, but it would waste my time and yours. However, I do want to point out the excellent guitar harmonics at the end of the track. They’re marvellous – as is the guitar playing everywhere else in the rest of the track. By the way, and this won’t be of interest to anyone, but I’ve always like The Doobie Brothers (I’ve had Best Of The Doobies for years and love it), and I have to admit that my all-time favourite driving song is “Listen To The Music”. If ever I’m cruising down a highway with the wind in my hair, “Listen To The Music” is the perfect song to listen to. You are currently browsing the archives for the Keys category.